I really enjoyed this cheesecake and appreciate the effort they have made to include gluten free desserts in their product line. I've been a fan for years and can't rave enough about Eli's. The ricotta cheesecake wasn't too sweet and the almond crust was delicious, if not more flavorful that the usual graham cracker crust many other cheesecakes are made of. The ricotta cheesecake also serves as a great canvas for a topping such as cherry, strawberry, apple, or even chocolate or caramel. If you're looking for a dessert to share on your holiday table, or any time for that matter, Eli's Cheesecake is a great option. They can ship their delicious cheesecakes, cakes, pastries and other desserts within the U.S., including Alaska and Hawaii... and all orders are shipped with dry ice in heavy duty styrofoam containers to ensure they arrive at safe temperatures. Saturday, November 23 from 8am-2pm ONLY! Save 20% on your purchase at Eli's Thanksgiving Virtual Dock Sale! when you purchase a 9" Original Plain Cheesecake! For mail order only. Not valid with any other offers. In fact, to encourage you to get a taste of Chicago's very own Eli's Cheesecake, be sure to check out their Virtual Dock Sale happening this coming weekend! 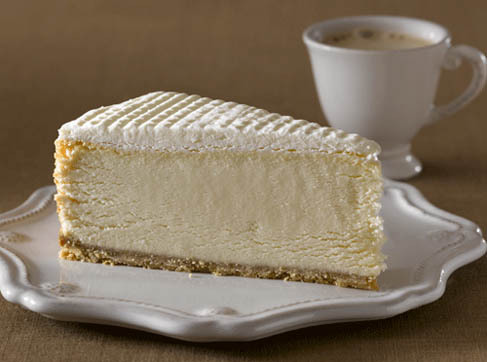 And because I want to share the love, a special reader will receive a cheesecake to enjoy. Simply leave a comment with the type of Eli's cheesecake you'd like to receive and a comment will be randomly chosen to receive their cheesecake in the mail for free! The winner will be contacted directly so good luck! I would love to try the GF salted caramel cheesecake! I would love to try the Espresso Cheesecake. Salted Caramel cheesecake sounds delicious! I would love to try the Hot Chocolate Cheesecake!